New classics with a twist. Stairwells, mantels, balconies, and door frames – these are just some of the places we love to decorate with Christmas garland. They instantly add a festive touch to any room in your house, and are a lovely way to spruce up your front door for the holidays. With our fabulous selection, creating magical Christmas displays is easy, and what's best, there are no dried up needles to clean up! Our artificial garland stay beautiful for many years to come, saving you a lot of money along the way. 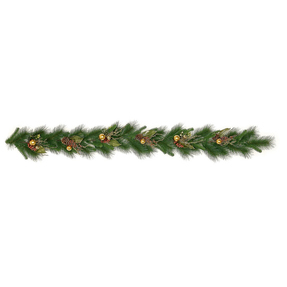 Our green artificial Christmas garlands come in a fabulous variety of styles, from wispy pine needles to thick firs, with and without pine cones, both unlit and pre lit. While the needles are all green, we also have a great selection of frosted and flocked garlands to add a magical snowy element to your decor. Starting at 6' and going up to 50' in length, we've got the garland for any decorating project you can imagine. All of our green garlands can be used indoors or outdoors, with the exception of those with frosting or flocking. Our decorated artificial Christmas garlands are an exquisite collection of the most beautiful garlands you've ever seen. They come in an amazing variety of styles including our popular Rosehip Garland, Velvet Poinsettia Garland, Magnolia Garland, and Holiday Ivy Garland. These garlands come in a variety of sizes from 3' to 6' in length, and are made for indoor use or in protected areas only. Our flocked Christmas garlands are the perfect choice to add a wintry look to your home while still staying warm inside. They come in sizes from 5' to 9' long, both unlit and prelit, and with everything from a light dusting of snow to fully flocked. Some of our flocked garlands also have pinecones. Due to the flocking, these garlands can only be used indoors. 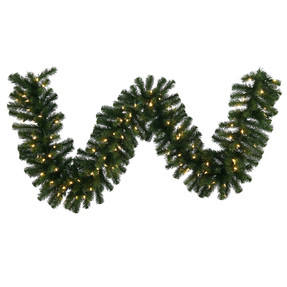 Douglas Fir Garland LED 9' x 16"
Blue Spruce Garland LED 9' x 14"
Frosted Silver Pine Garland Prelit 9' x 14"